This Thursday, November 17, 2016, at 7:30 p.m., the Woodwind and Brass Ensembles will perform various numbers that highlight the woodwind and brass instruments. The performance will be held in the Thorley Recital Hall in the Music Building at SUU. Admission is free and the performance is open to the general public. Musical numbers from the Woodwind Ensemble include Minuets 1 and 6 by G.P. Telemann, Album Leaf by Hans Sitt, and Rialto Ripples by George Gershwin. 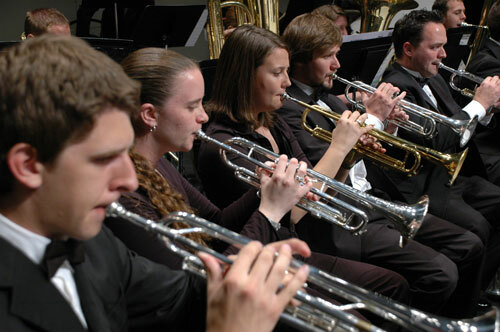 The SUU Brass Ensemble is a quintet made up of SUU’s finest brass players. The Brass Ensemble includes Austin Clark and Laura Bird on trumpet, with Brayden England on the French horn, Robert DeBry on the trombone and Jacob Austin on the tuba. Trumpet players Austin Clark and Laura Bird are veterans of the ensemble and have helped refine the group's classic sound. The Brass Ensemble portion of the program is made up of a variety of music including traditional brass quintet works, as well as more contemporary sounds. Brass Quintet No. 1, Op 5 by Victor Ewald, Quintet by Michael Kamen and Escape by Kevin Mckee will be included in their performance. The Brass Ensemble will also premiere trombonist Robby DeBry's original work, Atitlán. Join the Woodwind and Brass Ensembles for an evening of music you will not forget as they perform these challenging pieces and premiere new work by one of SUU’s students.